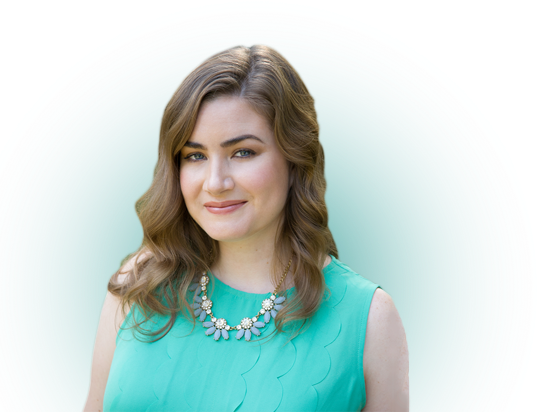 Back in April I took a big career leap and left my steady desk job for the thrill of joining a start-up – where I still have a desk and a steady paycheck, but you know what I mean. I left behind one important thing when I started my new gig — my retirement fund. I needed to rollover a 401(k) before I felt I’d completely moved on. Fortunately, my new employers offered a matched on a new 401(k). Unfortunately, my only option was a Traditional 401(k), so I couldn’t easily roll over my current Roth 401(k). Why, you ask? Because Uncle Sam and the IRS say so. A Traditional 401(k) is a pre-tax account, so it lowers my taxable income (yay!) but it also means I’ll have to pay taxes on that money once I start making withdraws in retirement (boo…). A Roth 401(k) means my contributions were taxed before going into my investments. My income doesn’t get a tax break now, but I can take money out in retirement without Uncle Sam’s grubby fingers all over my fat stacks. So, I had to make a decision about what to do with my original 401(k). 1) Leave it: I had enough money in the account (just north of $8,000) to qualify for leaving it alone. But wait, why two IRAs? While I had been contributing post-tax money into my 401(k), my employer had not. The contribution from my former employer needed to be rolled into a pre-tax account. My new, traditional, 401(k) would qualify and so would a traditional IRA. After slight deliberation, I felt it would be easiest to roll my old 401(k) into two Vanguard IRAs – one Roth and one Traditional. I already had a traditional IRA set up with Vanguard, so it took me all of five minutes to get a Roth IRA prepped for my roll over. I clicked on “start your rollover online”. After answering some simple questions they directed me how to split my 401(k) into the two IRAs. I found it easiest to just ask the kind folks in charge of my current 401(k) how much had been taxed (my contributions) and how much had not (the employer contribution). I then filled out paperwork from my former employer to start the rollover process. My former employer was in the process of moving their 401(k) program from a company called Plan Destination to Fidelity. I had been warned I had to rollover a 401(k) before the black out date when the change occurred. So – even though I filled out my paperwork on time, they didn’t finish it in time on their end and started rolling over my 401(k) to Fidelity. Now I had another decision to make. Do I just leave my 401(k) with Fidelity – another reputable brokerage firm – or continue with the initiation to rollover into Vanguard? Admittedly, another Fidelity product caught my eye: the 2% cash back card, because you can put your cash back into an IRA. After some more deliberation, I decided to go ahead and move it all to Vanguard. I liked the idea of simplifying where my money would be, plus I had a relationship with Vanguard and loved their customer service. 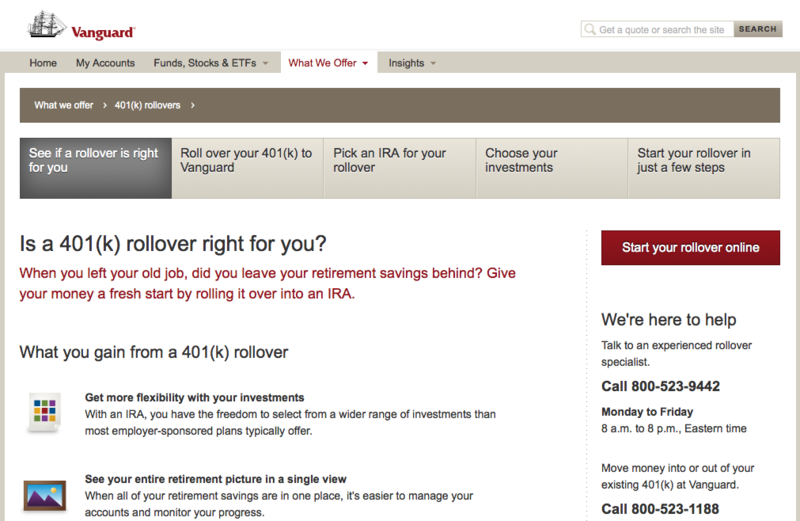 To get my rollover started, I simply called Fidelity and told them I’d like to rollover my funds to existing IRAs with Vanguard. I made sure to verify the Roth (post-tax) funds would be on one check with the pre-tax funds from my employer’s contribution on another. Unfortunately, another small inconvenience occurred. If my paperwork had been processed properly prior to the blackout date, I could’ve just had Plan Destination roll my money over to Vanguard (by sending checks to a Vanguard P.O. Box) with no problem. Fidelity didn’t play that way. Instead, they insisted on sending me the checks and then I had to send them on to Vanguard. I called Vanguard to explain I would be mailing in the checks myself, verified the address I should send them to and asked if I needed to do anything else. The kind customer service rep recommended I write a brief letter detailing exactly where each check should be deposited, even though it would be detailed on on the check. Taking his advice, I wrote a quick summary of the amount on each check and which type of IRA it should be deposited into and the corresponding account numbers. The checks showed up about a week later, and I walked them over to the post office, sprang 63 cents for a stamped envelope and dropped them in the mail. Like magic, I saw the funds in my Vanguard account three days later. But you probably want to know what I did. You need a certain amount of money to buy into various funds, which limited some of my options. For my Roth IRA I went with a Vanguard 500 Index Fund and a Vanguard Target Retirement 2040 Fund. When in doubt, an S&P 500 fund is a pretty solid pick. My traditional IRA was already set up (also including the Vanguard 500 Index Fund) – so I just dumped my rollover funds in the existing investments. Wait – you don’t even have a 401(k)?! GASP! I know not everyone feels they can afford to be contributing to retirement yet, but if your employer offers an employer-matched 401(k) then you best be investing. At least enough to get the match. Otherwise, you’re throwing up the finger to free money. That wasn’t a typo. FREE MONEY! Still thinking about it? 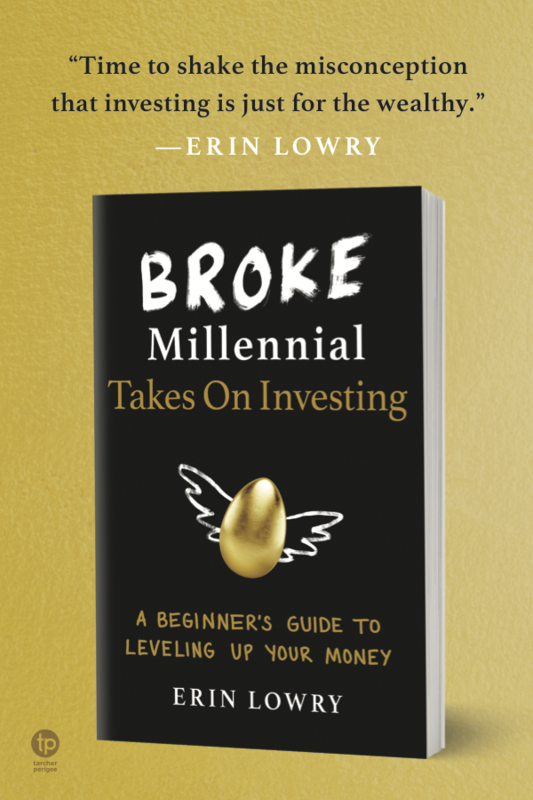 Then please read my post on the magic of compound interest or this one breaking down 401(k)s #MillennialStyle. Wow Erin, that just seems extremely complicated. This newest job that I might go into has a 401k, so I might need to look up some more advice. All my other jobs don’t really have one, so I can’t really do anything about that. Setting up a 401(k) is completely different. This is what happens after you have one with one job and are moving to another job. And don’t worry, it really isn’t as complicated as it may have read. I think people assume this is a really complicated problem, and you experienced some snags, but at the end of the day, it really isn’t that difficult. 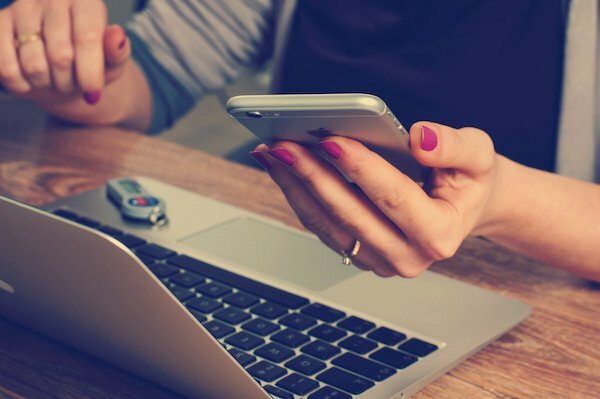 Most financial services companies have a very streamlined process for rolling over your accounts that you can simply click a few buttons. Agreed. They don’t want it to be complicated for you to rollover because they want your monies! And I didn’t experience any rudeness during the entire process. When I left my job with the federal government, I left my 401k (TSP) there because their retirement plan is pretty awesome with fees that are even lower than Vanguard. When my wife left her job, she called up Vanguard and they walked her through the process which was more or less smooth. Yours seemed a little complicated…but hey you got it done. Mine was more complicated because a) my old company screwed up and didn’t switch over my funds in time and b) I had a Roth 401(k) so I couldn’t just roll all the contributions into one fund. But honestly, it wasn’t that hard at all and I have one of the more complicated versions. Also props to Vanguard and Fidelity’s customer service/ rollover experts. So no excuses for other folks when they need to roll over a 401(k)! As long as it gets done- there might have been some snags along the way, but that’s always the case. I’m sending this to a friend right now who is debating the same thing. I honestly haven’t figured out what I would do with mine if I were to leave my job, but it’s something I should definitely be considering. There is one issue will rollover IRA. If your income exceeds the Roth limit and want to do a “backdoor Roth” you end up owing taxes on your entire IRA… The tax bill could be huge if you have even a decent sized nest egg in your 401k! Good on you for sticking through the rollover process despite the hiccups. I’ve never had a 401(k) but when I do leave a job with one I’m definitely planning to roll it to my IRA. This was an interesting read as I may be switching jobs soon myself. I currently have a Roth IRA with Vanguard invested in the Total stock market index which has been performing great. It’s so hard to beat their performance because their fees are so low. Glad everything worked out for you in the end. On a side note, you can still get the 2% Fidelity credit card if you sign up for “Cash Management Account” (which is essentially an online checking account.) Once you sign up for that you are eligible for the Fidelity Investment Rewards card and the rewards get deposited into that checking account. The account itself is pretty good it has no ATM fees and free checks. This is a great post for 2 reasons. First rolling over a 401K to a low fee IRA/Roth IRA and mentioning saving in a 401K to begin with. Always take advantage of your company’s 401K benefit. Moving your 401K to a low fee IRA as those provided by Vanguard was a very smart move. Even though most 401Ks will allow you to just leave the money there after you have changed jobs they usually have higher fees and less funds to pick for your investments. Fidelity does have similar low fee Mutual/Index funds like Vanguard and maybe opening an IRA/Roth there would have been more seamless but making the move to low fee funds is what is important. OK, I am a 56 year old freak who retired young at age 51 the first time and this is a millennial oriented site, but my kids are millennials and I care about what millennials think about retirement and saving for it. I love the way you think and as someone who took way too long to achieve financial independence I can say that whatever it takes to get there it is totally worth it. Keep up the great posts. I used to assume that it is a difficult problem, and I had some snags. In the end, I realized that it wasn’t hard really because there are companies out there who have financial services that can roll over my account. It’s very helpful indeed. Thanks for sharing this post. This post contain very useful information. I’m glad to hear you had a good experience. I’m in the same boat, part of my 401k is Roth and I hear about all these bad experiences rolling over to Vanguard, especially if it’s complicated. i’d prefer to consolidate to Vanguard, i already have a Roth IRA there, but not a traditional one.